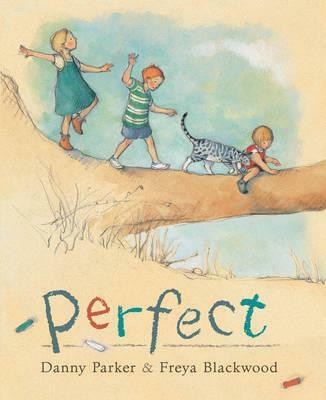 This beautiful, evocative picture book perfectly captures the magic of childhood. Parker’s simple yet thoughtful words conjure the fun and freedom of a day filled with creative pursuits and adventure, without an electronic device (or an adult!) to be seen. Three siblings and an adorable, loyal cat have the space to do and dream as they scribble, mix, climb and run through Blackwood’s depiction of a country cottage and idyllic landscape, in her inimitable, signature style. Even my five year old co-reviewer recognised her art – ‘it’s Cleo!’ she exclaimed, in reference to Blackwood’s illustrations in The Cleo Stories. The gentle narrative is divided by a wordless, double-page spread in the book’s centre, which provides an aerial view of the children’s surrounds. Their world spans the beach, farmland and a hilltop village – a dreamlike childhood setting. This signifies their return home and the onset of rain, and a reflective, cosy ending to their day. It does indeed look perfect.